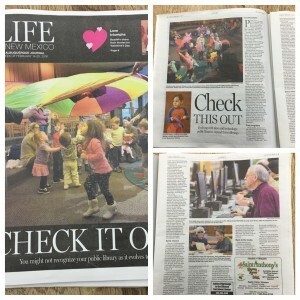 On Valentine’s Day, readers of the Albuquerque Journal were treated to a wonderful story about the evolution of public libraries to fit the needs of today’s patron. The story featured the Albuquerque Bernalillo County Public Library system and the Rio Rancho Public Library system. Librarians’ jobs have changed throughout the years from answering simple questions like who the President was in 1895, to now teaching patrons how to use their electronic devices (hopefully to download library ebooks!) or hosting programs on using 3-D printers or even how to start a business! And all of this is provided free of charge! Keep up the good work Albuquerque and Rio Rancho!